The moon may be shrinking. That's the word from scientists analyzing data from the Lunar Reconnaissance Orbiter, a NASA probe returning tantalizing pictures of young faults on the moon. Sharp images from LRO's narrow angle camera show thrust faults and associated staircase-like terrain spread across the surface of the moon, a sign that the moon could still be geologically active. "I think there's a general impression that the moon is geologically dead, that everything important in the geologic history of the moon happened billions of years ago," said Thomas Watters, a senior scientist at the Smithsonian's National Air and Space Museum. "One of the most exciting results of this research is that this is just not the case. The moon may still be geologically and tectonically active and still shrinking today." The moon has likely shrunk an average of about 300 feet within the last 800 million years, according to Watters. Researchers pointed to the thrust faults, fractures in the lunar surface created as chunks of the moon's crust collided. The faults forced rock upward, forming a series of cliffs known as lobate scarps. The thought of lunar shrinkage isn't new; scientists have long predicted the moon contracted as it cooled from its hot and violent genesis four billion years ago. But LRO's findings indicate there could still be some leftover dynamism inside the moon driving geologic activity at the surface. If it's not still going on today, scientists know it only stopped in the recent past. "Where once we thought that changes occurred over billions of years, we're now finding that some of these changes may be occurring over much shorter time periods and may even be occurring now," said Michael Wargo, the chief lunar scientist in NASA's exploration division. The lobate scarps cut across small impact craters and look pristine in imagery from lunar orbit, signs that the features are relatively fresh, perhaps as young as a million years, scientists said Thursday. If it happened so recently, the contraction could still be going on today. Computer models project the moon should still be cooling, Watters said. Wargo said the evidence of geologic activity challenges experts' views of the moon. "Before LRO launched, it was pretty common for a lot of folks, including many scientists, to think of the moon as a dead, unchanging planet," Wargo said. "After only a year of observations from LRO, we're finding that, to the contrary, the moon is a truly dynamic planet." Watters said the cliffs are small. The largest scarp is about 300 feet high and stretches several miles long, and other features are even smaller. Because the scarps are modest, only high-resolution pictures from LRO can spot many of the faults. About 10 percent of the lunar surface has been mapped in such detail so far, according to John Keller, LRO's deputy project scientist. It could take three more years to finish a detailed map of the moon with a resolution of as low as about 3 feet, so more discoveries are expected in the future, officials said. 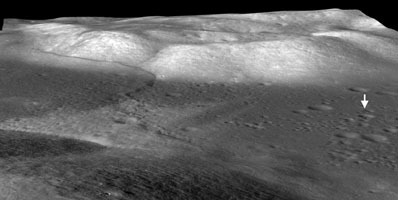 One of the scarps was explored by astronauts in December 1972. Located in the Taurus-Littrow valley, the fault was just west of the Apollo 17 landing site. Watters said scientists are investigating possible links between the thrust faults and moonquakes detected by seismic sensors left behind on four Apollo lunar landing missions. "One of the things we're looking into is exactly that possibility, if there's any spatial correlation between these known moonquakes and any of the lobate scarps," Watters said. "I think it is certainly a possibility." According to Watters, the Apollo seismic equipment detected about 30 moonquakes with shallow depths, but there are no definitive ties between the tremors and the known faults. Other researchers are comparing imagery from Apollo orbiters and LRO to see if any of the scarps have changed in the last 40 years, indicating ongoing activity. 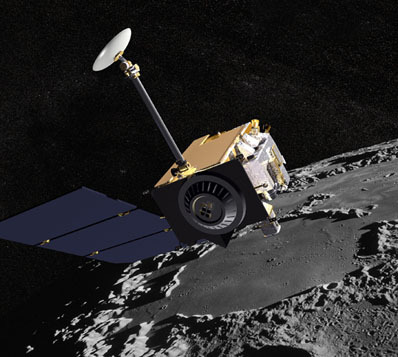 LRO will wrap up its one-year prime mission in September, when management of the probe will be transferred from NASA's exploration directorate to the science division for another two years of observations. The spacecraft will likely be moved from its current circular orbit 30 miles above the moon to an elliptical path stretching from an altitude of 19 miles to nearly 125 miles. The new orbit will help save fuel on the orbiter, possibly permitting another life extension beyond 2012. But the higher orbit will also affect the performance of LRO's camera, reducing its average resolution from 1.6 feet to more than 3 feet.